Your monument provider is happy to work with you to create a permanent tribute to the life of your loved one. No matter what you have in mind, any gravestone or larger memorial structure you can dream of can be created for you. Physical monuments can be created using a number of different materials. 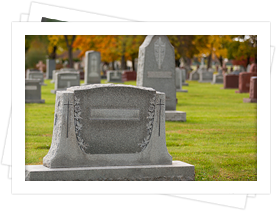 Your monument provider offers several different colors of granite grave markers and headstones, as well as cast bronze options. Granite memorials can be configured in a number of different shapes (described below), while bronze markers typically lie flush with the burial ground. Both materials can be used to create monuments at a wide variety of price points to suit your family’s needs. 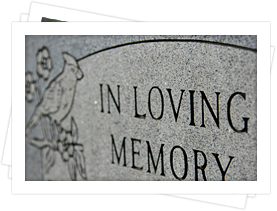 Your monument provider is capable of creating benches, crosses or other specialty memorials according to your specifications. Please note that your choice of final resting place may dictate the types of monuments that may be used. 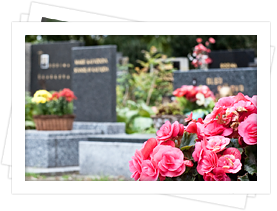 Contact our office or your monument provider for more information on your chosen grave site or final resting place. Many monument providers offer more than 300 images and themes that can be carved into your memorial, either by hand or with the use of a sand-blaster. These images include religious symbols, flowers, birds, sports iconography, frames and more. Offering both hand and laser etching allows monument providers to create finely-detailed drawings that are etched into the finish of your chosen memorial. Your provider is able to offer a wide selection of different etched images or transfer any drawing you provide to your monument. Any words to be included on your monument (including the name of the deceased, life dates, quotes, scripture verses and more) can be stylized using a number of different fonts and carving techniques. Contact our your monument provider for a full list of all available options. We understand that the process of selecting a permanent monument for your loved one can feel overwhelming. Our office is here to assist you in any way possible with your final decision. If there is anything we or your monument provider can do to support you during this time, please don’t hesitate to let us know.